About one week later, I have returned to announce the poll results of the 8th Okay! Musume Time poll. It's been a while, hasn't it? I apologise for that, I've just been stressed lately (still stressed, actually) and I haven't felt the creative flow of the blogger in me for a while. It actually depresses me a bit, since I really do enjoy blogging and having people read what I write, even if half of it is horribly written. ANYWAYS ONTO THE RESULTS OF THE POLL! This week's winner is the flagship group of UFA, Morning Musume, with 18 votes (69%, as a friend pointed out). So, congratulations to Morning Musume on beating the rest of the groups and rising to the top as the most loved group in UFA! Coming in second is one of the newest permanent groups within Hello! Project and UFA, Buono!, with 9 votes. Running to third place is the ever so loveable C-ute, raking in 7 votes and taking away the crown from Berryz, who come in fourth place with 4 votes for their team. Next, in fifth place is the sekushii Mano Erina, taking two of the votes whilst last, but not least, is S/mileage, with only one vote. I guess the new members, the graduation of Saki and the impending DOOM of Yuukarin kinda lost a few fans, eh? For this poll, I got a total of 26 votes. Thank you to everyone who participated in this poll and gave their truthful answers, I really appreciate it ;A; I love you all. Minna, arigatou!!!! So that is the poll for this week! What will the next question be, who shall it involve? WHO WILL YOU VOTE FOR!? This weeks poll will be a question on groups outside of the UFA box, and it is: Which of these Groups do you like? I will be putting various groups there that I'm sure most of us know of, like Idoling!! 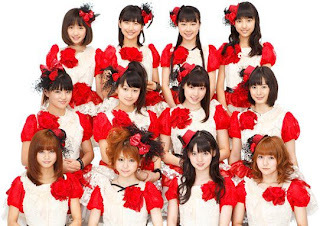 !, Afilia Saga East, Momoiro Clover Z, AKB48 and more! There are 9 options for this poll, made up of groups that most of you may have heard of, or some you will be new to, so please check them all out and give them a try! This question is coming from the fact that I've actually been listening to more groups outside of Hello! Project lately rather than Morning Musume or C-ute. I've just felt that I needed the change of pace, and I am adoring quite a few songs. So! Have fun with this poll, and hope to see you in my next post! I'm so glad I'm done with university because I know exactly what you mean about being too stressed out about it to actually do things you enjoy. I'm happy Buono! ranked so high and in the end was made permanent. I love pop-rock so they're a group that's right up my alley and I hope they stay around for a good long while. Buono is a very good group ;D but it's got three very talented and popular members in there, so it's no wonder. And I don't mind pop-rock, but Buono were one of my first Idol groups that I adored.